Turning Vision Into Action: At All Costs: Avoid Using the Mysterious "They" ! At All Costs: Avoid Using the Mysterious "They" ! Fully Engaged PLC Leaders Shun Faulty Assumption Thinking! As you review your personal behavior and your team's behavior in 2010-2011, is excuse making and blaming others (external factors) for your inability to get things done part of your teacher and leader "talk"? If so, it is a sure sign that you, or those in your sphere of influence, are drifting into an energy crisis. 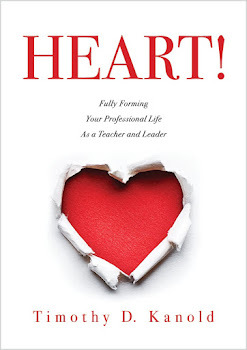 Author James Loehr (2008) highlights this issue as “faulty assumption thinking” and provides insight into how leaders—at all levels of the school organization—tell themselves terrific excuses for why they do not need to strategically plan for a better school "life" in 2011-2012. These faulty assumptions feed into a sometimes-unintentional victim mindset that you generally would not tolerate in others. More importantly, these excuses in the aggregate become a consistent pattern of “no accountability” half-truths that allow you to justify your leadership drift into an energy crisis. The following table provides a sample of faulty assumption indicators often observed by the leadership in professional learning community cultures. · Our students can’t learn because they don’t show up for class, they don’t attend the support we provide and they don’t care. What do you expect us to do? · Most of our team problems stem directly from all of the stress placed on us by the Principal. We’d be a more responsible and engaged teacher or leadership team without that pressure. · The only way I can meet the demands of PLC expectations is to work longer and harder. As a principal, the central office demands placed on me are relentless. · I must constantly check my e-mails, my texts and my blog at home because as an academic coach I am responsible for a lot of people and they need an immediate response. · My teaching day controls me—not the opposite. I’m not the boss of anything. I have no control. I just do what they tell me to do—it’s more, more, more. And now they want me to part of a team? · I invest most of my energy in the classroom and not with my team. I’m doing it all for the students anyway and the team doesn’t really need my “stuff” or me. · The team drags me down. Working on my own is my right and no one can take that away from me. What right does the Administrative team have to tell me what to do anyway? · It’s okay that I am not spending a lot of time observing my teachers teach and learning more about their needs. I run a very well managed school and the faculty understands this is what is most important. · It’s okay with my family when I come home from work exhausted and disengaged. They appreciate all that I do for the school. · I can get away with not passing assessments back to my students right away. They understand. Someday I have to significantly change the way I grade, but I still have time to figure it out. · Taking care of myself physically is a luxury I can’t afford right now. I devote what little time and energy I have to the areas of my life that matter most—my family and my job. Can you see how “thinking” like this can lead to an unbalanced, excuse-making leadership life? It can send you spiraling into an energy free fall with little or no time to lead well due to distraction, lack of sleep, and an inability to keep all those work, family, and health “plates” spinning? If you were to spend time in serious reflection about how you are doing in 2010-2011, you would be able to see through the veneer of these excuses. Your own personal excuse-making barrier to a more serious pursuit of a better and more balanced life would fall. The “no one in my current job, home, life situation could find happiness” is a wonderful barrier to hide behind. Why do adults tend to blame others and use the mysterious “they” for their faulty assumptions? 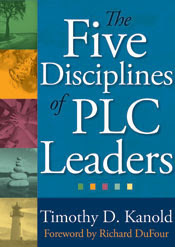 It is so much easier to just say, “They won’t let us do this.” Or, “They are making us do this.” Or, “They just don’t understand our problems.” One quick way to check the temperature of your PLC teacher and leadership life is to observe for the volume use of the word “they” in your area of school leadership. During my 20 some years at Stevenson, we had to banish use of the word "They" throughout our various learning teams. We had to call out every stakeholder group every time the word “they” was used. Who is “they” exactly? Central office? The administration? The PLC learning team? The faculty and staff? The students? The parents? Early in my second year as principal, following a leader who had been in the building for 34 years, 17 as principal, I detected a "they" in the culture of the building that I would not tolerate. Students in specialized programs for behavior or for severe learning disabilities, even mainstreamed students with IEP's were "they"ed. Teachers would refer to them by their case manager's name, "He's one of Pam's" or "She's with Debbie, isn't she?" After a year of listening to this, I decreed that the education of every child in the building is the responsibility of every adult in the building. Over time, this behavior has changed, but now the "they"ing as shifted. "My teaching day controls me—not the opposite. I’m not the boss of anything. I have no control. I just do what they tell me to do—it’s more, more, more. And now they want me to part of a team?" This reflects the new paradigm of responsibility shifting. "They" now means central office, and "they" are a common and ubiquitous scapegoat. In our recent strategic planning, we identified aspects of PLC that we would like to pursue. The major roadblock is the disconnect between teaching staff and administrators. In order to move forward, we're going to have to break down that barrier and stop "they"ing each other. The Greater the Lean, the Greater the Trust! It's May - Time to Reflect and Renew !